I know… very purple, right? Definitely not my go-to color, but there it is anyway 🙂 In fact, the older I get the more I figure out that I don’t really have a go-to anymore! So, this one is super simple… this sweet little butterfly is from Meljen’s Designs and was colored with Promarkers. The trail is part of the digi, but I added the same “stitching” around the edge. 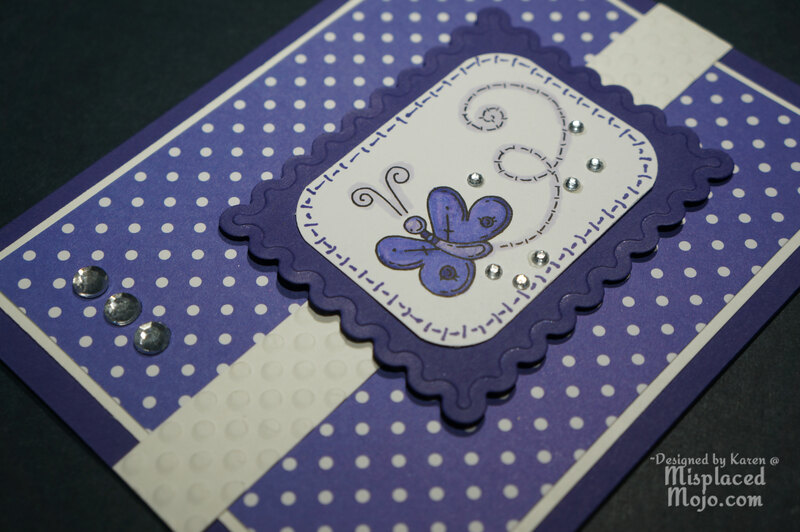 The mat was cut and embossed with a scalloped rectangle Spellbinders die. 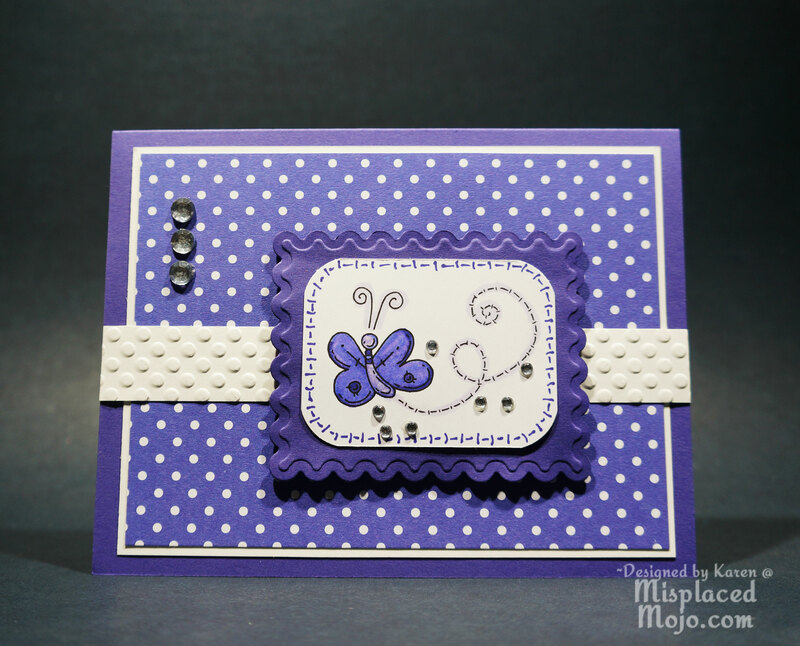 The white border was embossed with the 6×6 Dots embossing folder by Crafters Companion. 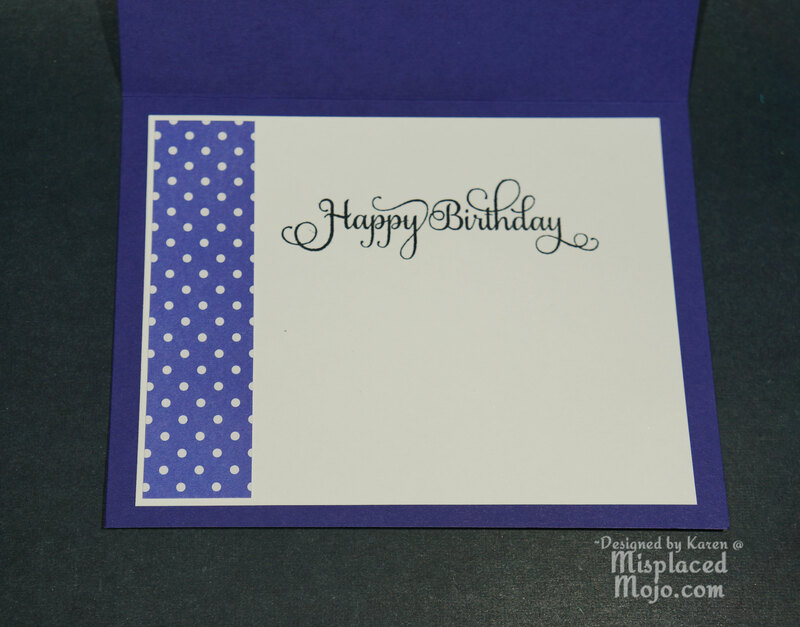 The patterned paper is from the American Crafts 6×6 Dots and Stripes pad. The card needed some pizzazz so I added bling to the circles in the trail of the butterfly and then to the card itself to give the whole thing some much needed sparkle. The inside has just of the patterned paper, and the birthday sentiment is from Justrite Large Fancy Sentiments set. Your card is coming out looking blue for me but I love it anyway. Really like how you have used the same stitching round the edge of the butterfly to match the trail already made. (Thinking outside of the box . Love it). Spotty paper compliments the design too. Thank you for fluttering by #3. Hope you will flutter along with me again. Hugs Mrs A. (Butterfly challenge). Beautiful card. Love the butterfly you used. Thanks for joining us at Created with Love Challenges. This is just beautiful! 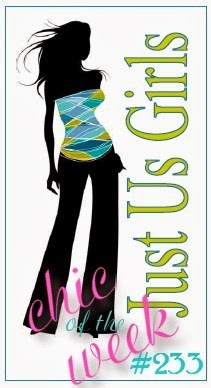 I LOVE the color scheme & layout you used…those polka dots are just awesome! 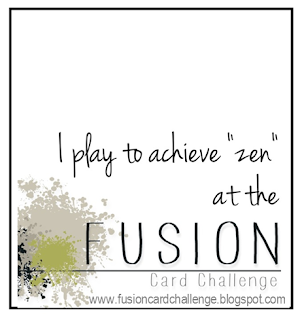 Thanks so much for playing along with us @ Creative Knockouts & hope to see you back again for our next challenge!! !